Neem oil (margosa oil) is deep yellow−colored with an unpleasant taste and smell and is an extract of the seed of the Neem tree (Azadirachta indica A. Juss), native to India but now widely distributed throughout Indo-Malaysia.1 Modes of consumption are usually accidental or by nasal instillation for the common cold in children as a traditional practice. Rarely is ingestion suicidal. Even small doses of neem oil are known to cause severe metabolic acidosis along with seizures, which can be refractory with known late neurologic sequelae.2 The diagnosis is based on patient history, clinical examination, and imaging findings. We report cranial MR imaging findings in a patient with suicidal consumption of neem oil. A 35-year-old female patient presented with bilateral vision loss with a history of consumption of about 150 mL of neem oil 5 days previously. On examination, the patient had no perception of light, with dilated and sluggishly reactive pupils in both eyes; the fundus showed bilateral hyperemic and edematous disks. Deep tendon reflexes were exaggerated, with bilateral extensor plantar reflexes. Laboratory findings were within normal limits. 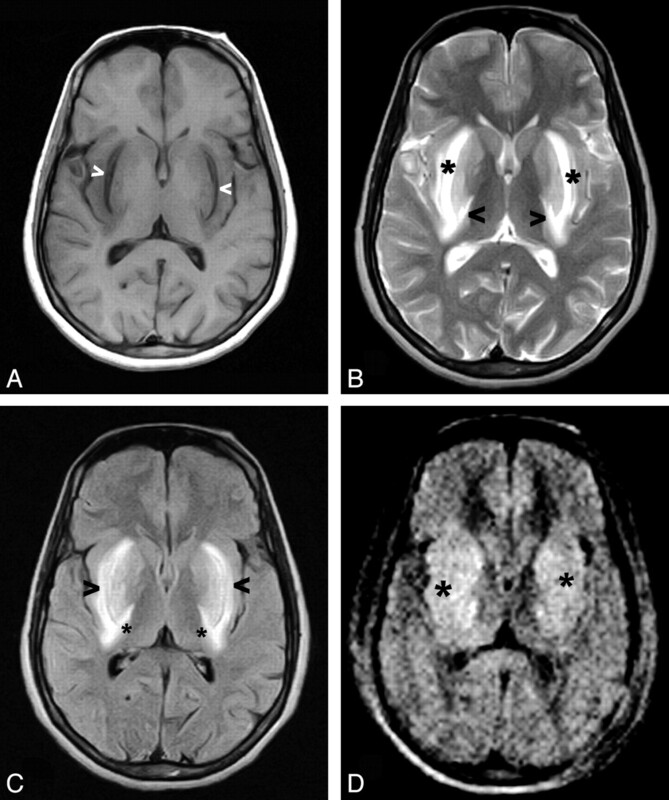 Cranial MR imaging, showed symmetric altered signal intensity in the bilateral putaminal regions with extension to the posterior limb of the internal capsule (Fig 1A−C) and restricted diffusion (Fig 1 D). At the end of 1-month follow-up after medical management with steroids and vitamin B12 injections, vision was improved in both eyes with normally reactive pupils. A, Axial T1-weighted cranial MR image shows bilateral putaminal hypointensities (arrowheads). B, Axial T2-weighted cranial MR image shows bilateral symmetric hyperintensities in the putamen (asterisks) and extension to the posterior limb of the internal capsule (arrowhead). C, Fluid-attenuated inversion recovery image shows bilateral symmetric hyperintensities in the putamen (arrowheads) and extension to the posterior limb of the internal capsule (asterisks). D, Diffusion-weighted image shows bilateral putaminal restricted diffusion (asterisks). Neem oil is extracted from oil seed kernels, with active ingredients like azadirachtin, nimbin, picrin, and sialin. The pesticide action of neem oil is attributed to azadirachtin, which is used as an insecticide for arthropod pests.2 Poisoning causes vomiting within minutes to hours, followed by drowsiness, tachypnea, and generalized seizures associated with loss of consciousness and coma.3 Symptoms of neem oil poisoning should be treated, with no specific antidote and gastric lavage recommended.1 Bilateral toxic optic neuropathy with typical MR imaging findings of bilateral high signal intensity in the putamen is described commonly in methanol toxicity. We report a case of neem oil poisoning with similar MR imaging findings.